Judo has its roots in Ju-jitsu which goes back many centuries in Japanese history when it was a brutal and often lethal method of self defense and unarmed combat. 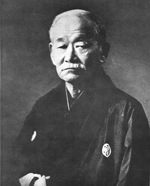 Judo was established as a modern physical activity when, in 1882, Professor Jigoro Kano founded his Kodokan Judo. Since the inclusion of Judo in the 1964 Olympic Games it has been regarded as a modern Olympic combat sport although some followers still consider it very much an ‘art form’. Kano said that Judo is a teaching for life itself and with it we learn to overcome the pitfalls and obstacles of everyday living. Judo is an ideal form of physical education. The beginner concentrates on getting the techniques right, and during the process inevitably improves general fitness. The bonus is stamina improvement which equips one better for the rigors of day to day life. People from all age groups, male and female participate in judo, from 4 years old and younger in some cases, right through to 70 years old and higher. Some “judoka” or practitioners of judo participate at competitive levels, while some only for recreational purposes. The Katas of Judo, demonstrating the principles in a structure sequence.